At Green Valley Ranch Pet Center, we don't just want your pets feeling healthy, we want them looking healthy, too. For our clients' convenience, we offer grooming services within the veterinary clinic. Our aim is to become the center for all your pet care needs. 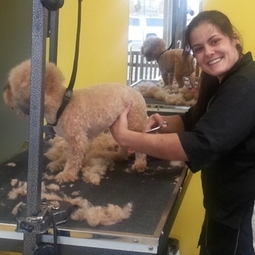 Our groomers have years of experience and they love what they do! From nail trimming and ear cleaning to shaves, detangles and all around beautification of your pet, our goomers are focused on making your pet feel pampered and then returning them to you looking stunning. Our groomers use only the best apple oatmeal shampoo and conditioner every time! Don't forget about your cats. Our groomers have a special finesse with felines!